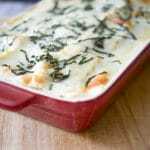 Roasted Vegetable Ratatouille Lasagna made with eggplant, garlic, tomatoes, squash and mushrooms in a cheesy Bechamel sauce can be assembled ahead of time and baked before serving making this a tasty weeknight meal idea. Summer vegetable gardens are growing in abundance right about now and Ratatouille style is one of my favorite ways to make to enjoy all of those yummy vegetables. 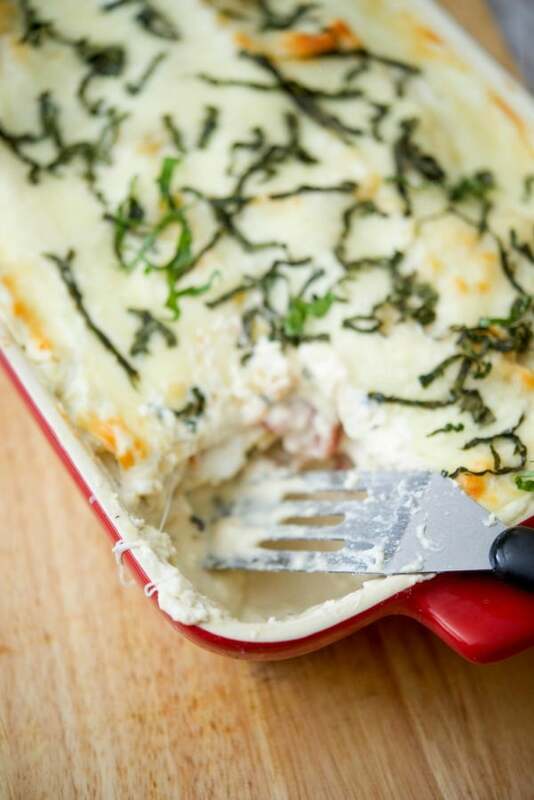 It’s also the time of year where the kids will be heading back to school soon and we start collecting recipes that we can either make ahead of time or cook, freeze and reheat to make weeknight dinner just a little bit easier. Well do I have a new recipe for you to try! 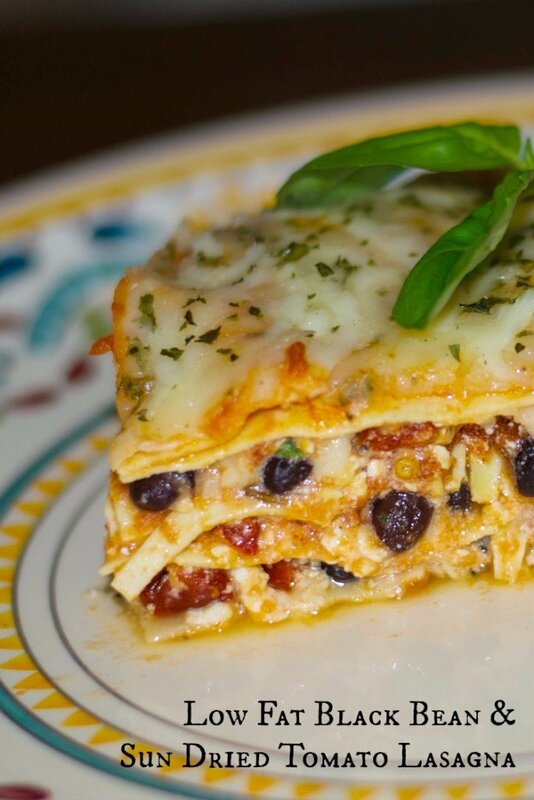 This Roasted Vegetable Ratatouille Lasagna fits both criteria; not to mention it’s absolutely delicious. We just came back from vacation and our eldest daughter will be heading back to college in about 2 weeks. I can’t believe how quickly that time went. 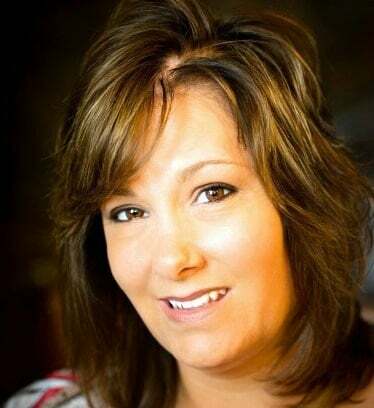 She was so busy taking two college summer courses and working two jobs that we rarely saw her. In any event, that means mom (a.k.a me) has to get busy preparing extra meals so that she can take them with her back up to school. This will be her fourth year living off campus (I still can’t believe she’s going to be a Senior in college…YIKES!) so she does know how to cook for herself. However, she has little time to think about different meal options during the week; though this post certainly comes in handy! I generally will prepare about 10-15 meals for her to take back with her and cook for four people every night; whether or not she’s home, then freeze her portion. This way, I know she gets some variety with her meals (and vegetables!) until she’s home the next time to pick up more. 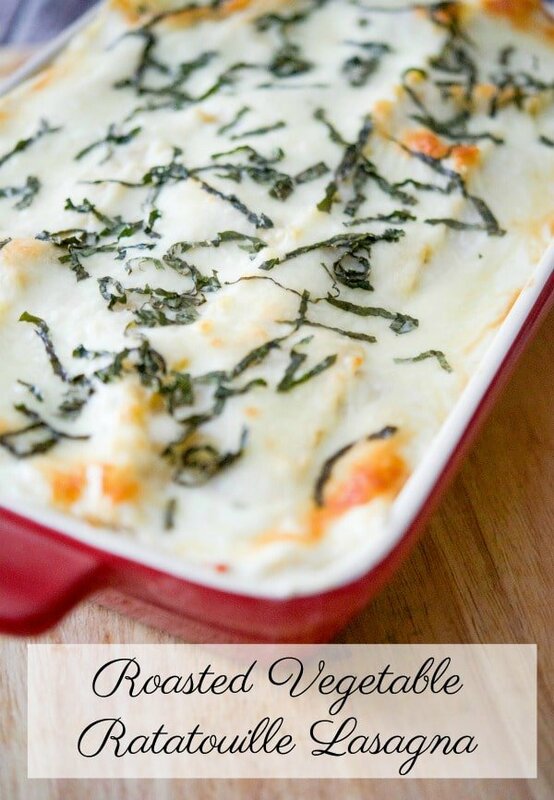 That’s why meals like this Roasted Vegetable Ratatouille Lasagna are perfect! By looking at the recipe card below, it might look like a lot of steps; however, you can do all of the prep work at the same time in about 30-40 minutes. I’ll break it down into steps for you. 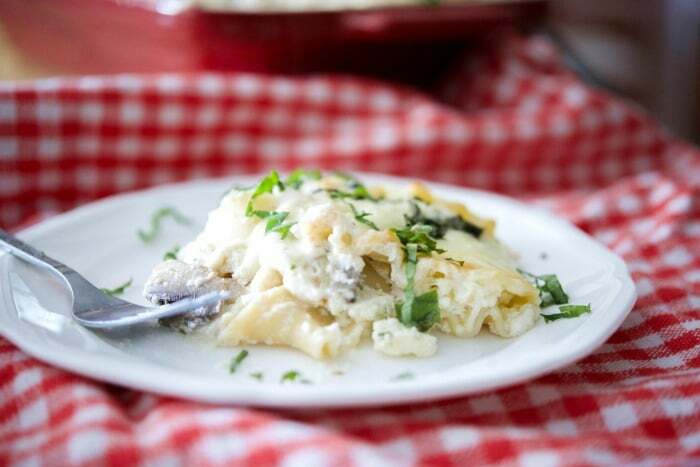 Cook the lasagna noodles (about 20 minutes). Start by bringing the water to a boil in a large pot. While you’re waiting, cut the vegetables and place in a large bowl. When the water boils, add the noodles and cook until al dente; approximately 8 minutes. Drain the water. You don’t want to cook them too long so that they are super soft because the sauce will soften them up more. Next, coat the vegetables with the oil and wine; then place on a baking sheet and roast the vegetables in the oven for about 20-25 minutes. While the vegetables are in the oven, make the sauce in a small saucepan on top of the stove over medium heat; which will take approximately 10 minutes. Remove from the heat when the sauce has thickened. Last, mix the cheese mixture in a small bowl while the vegetables are in the oven. This is where you have some options. 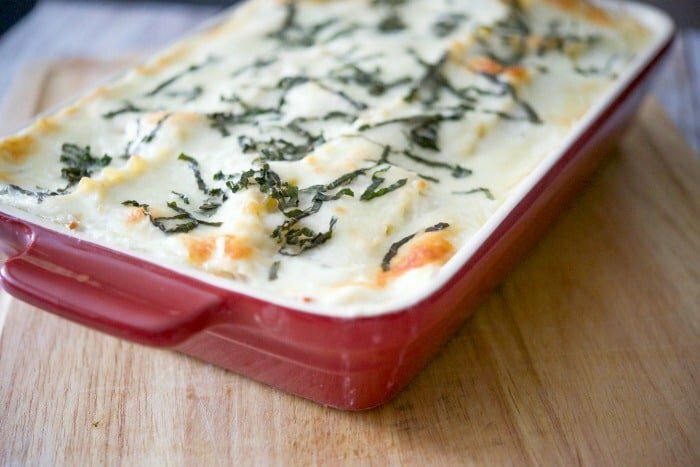 Bake the assembled lasagna in a 350 degree F oven for approximately 40-45 minutes until the cheese is hot and bubbly. Cover and refrigerate overnight; then bake the next day before serving. Cover the dish tightly and freeze for up to 3 months. Allow to defrost completely before baking as instructed. If I know I will be freezing this, I tend to use those disposable aluminum half trays; then cover tightly with plastic wrap before placing the metal lid on to ensure it doesn’t get freezer burn. See, it’s not that hard right? 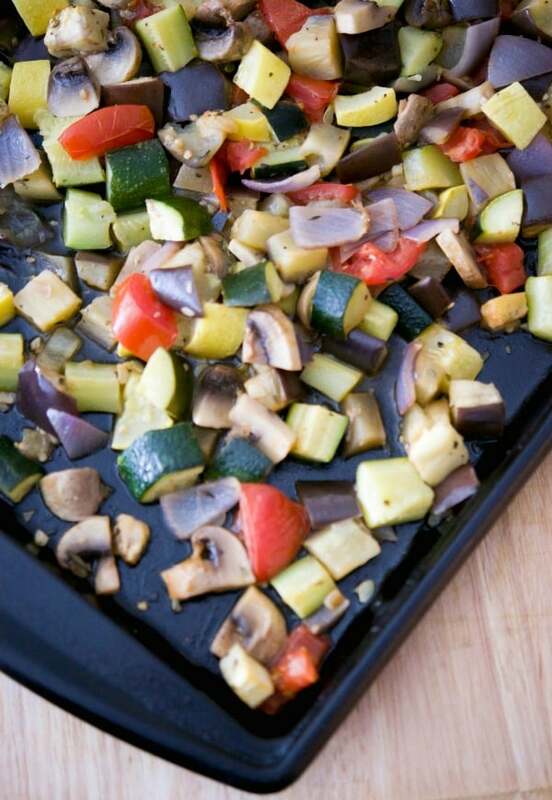 This Roasted Vegetable Ratatouille Lasagna is enough to feed 8 or if you’re serving it on a buffet with other items, you could cut the pieces smaller and get 14-16 pieces. 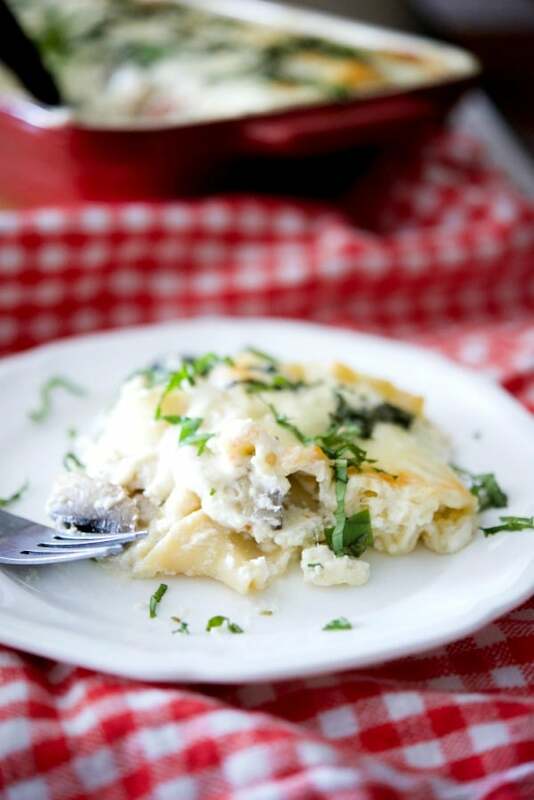 This recipe was delicious and my family really enjoyed it. Lucky for “R”, she gets to have it again at school; that is unless her roommates find it in the freezer first! ~Enjoy! Bring a large pot of water to a boil and cook lasagna sheets according to package directions. Drain pasta and set aside. 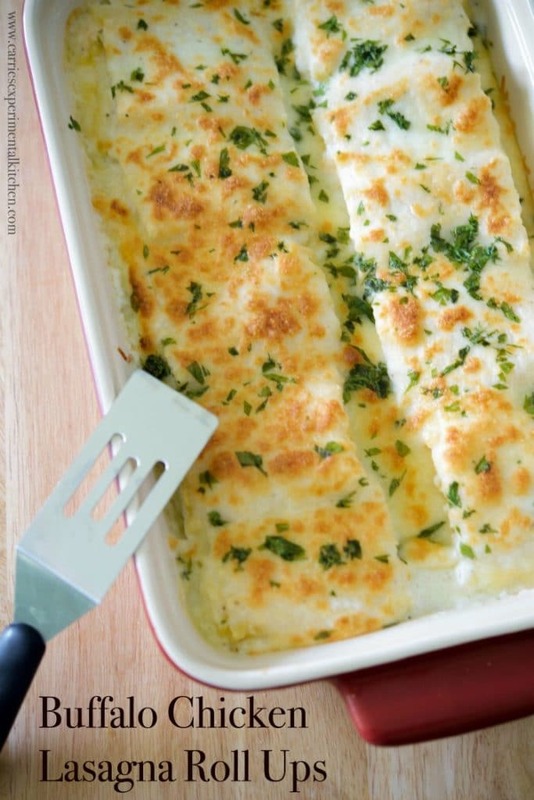 In a medium bowl, combine the ricotta cheese, 1/2 cup of the mozzarella cheese, egg, 2 tablespoons of the basil and garlic powder. Mix well. Next, assemble the lasagna in a 9"x13" oven safe baking dish. Coat the bottom of the dish with a thin layer of the sauce; then add 3-4 lasagna sheets to cover the bottom. Next, add a thin layer of the cheese mixture on top of the noodles; then add a layer of the roasted vegetables on top of that. Continue to layer the sauce, noodles, cheese mixture and vegetables until you get to the top of the dish (3 layers). Place one more layer of noodles on top of the vegetables, cover with the remaining sauce and sprinkle the top with the remaining shredded mozzarella cheese and basil. Combine all of the ingredients in a large bowl and toss to coat. 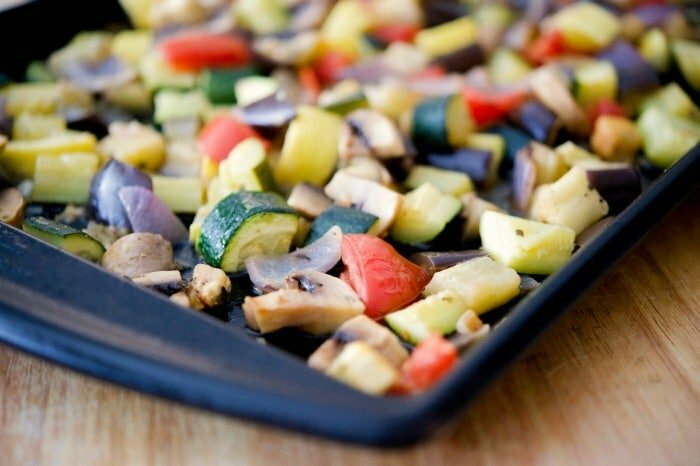 Add the vegetables to a baking sheet and roast for 20-25 minutes until the vegetables have softened. Lower the oven to 350 degrees F to cook the assembled lasagna. In a medium saucepan, melt the butter over medium heat; then whisk in the flour forming a roux. Add the milk and both cheeses and stir until the sauce has thickened slightly. Remove from heat and set aside. *You can assemble the lasagna the night before and cook the next day. 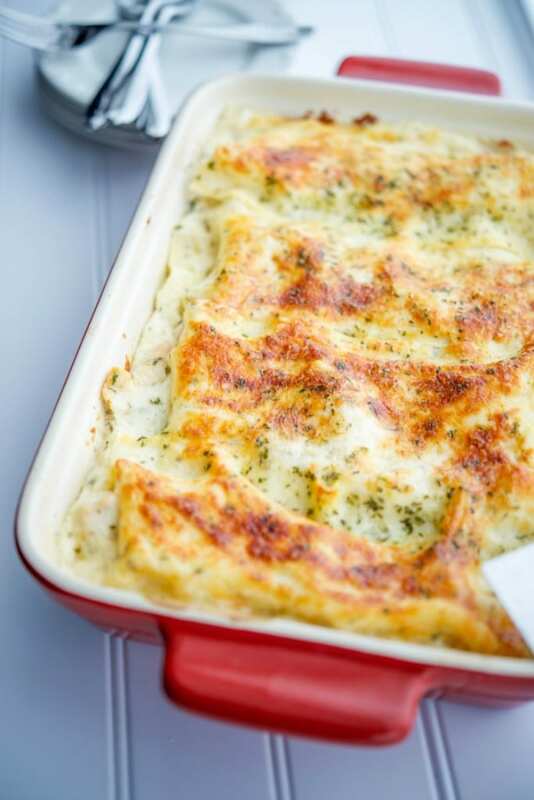 Or you can cover the lasagna tightly and freeze up to 3 months before defrosting and baking. 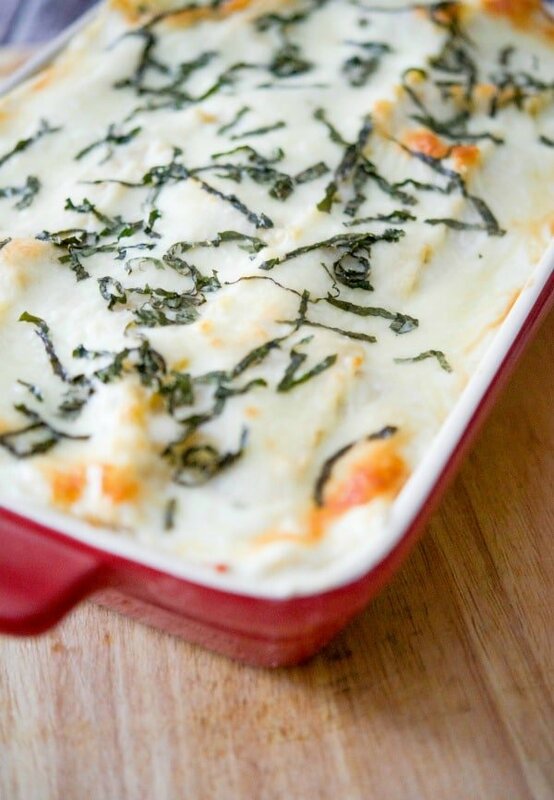 What is your favorite lasagna recipe?